Getting in shape with young kids can be challenging, we found that having a quality jogging stroller was key to getting healthy. We tried out the Joovy Zoom 360 Jogging Stroller and are sharing our experience. One of my new year’s resolutions was to get back into shape. After giving birth to my son last year, I was in need of a good workout routine. The problem… I hate to work out. When I say I hate it, I mean I find any excuse to get out of doing anything that makes me sweat. After much persuasion on my husband’s part, I finally joined a gym and I have been slowly getting back into shape. My husband is training for a mini-marathon in May and we have been thinking how nice it would be to work out together. The problem with that is that we have a baby and a dog that can’t stay home by themselves. 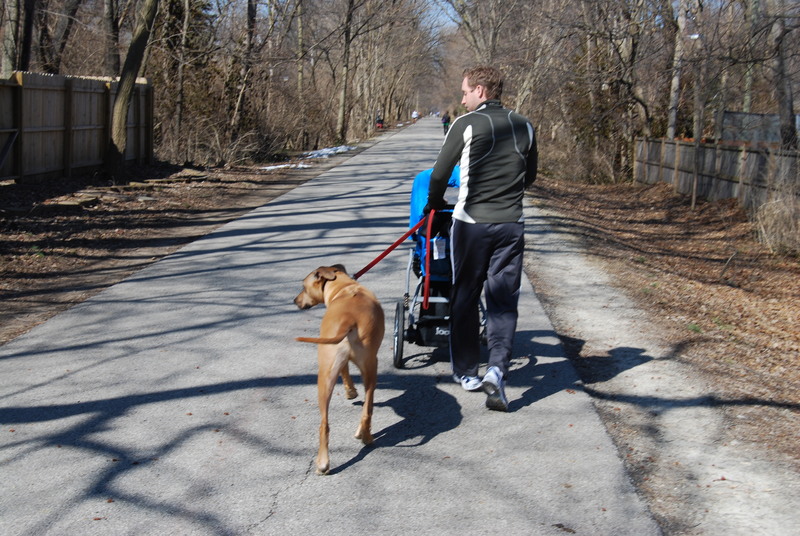 The solution… a jogging stroller. 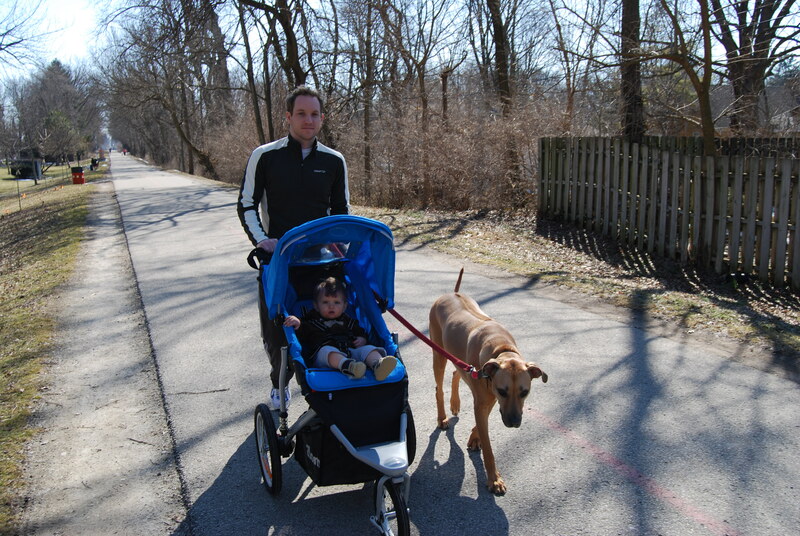 We needed a jogging stroller that can withstand marathon training and be easy enough to maneuver with a giant dog. We recently tried out the Zoom Jogging Stroller from Joovy with much success. After a quick alteration (more about that later) we were off and running. The Zoom 360 has 3-inch shock absorbing suspension that creates an impressively smooth ride for your child. Even when I went “off-roading” I found that this stroller was just as easy to handle in the grass and dirt. If you are looking for a stroller that can move in different tundra’s, the Zoom is the stroller for you! This is a necessity for our family. During the summers when I am off work, I love to take walks. I was getting discouraged thinking about how I would maneuver my current stroller and handle our very large dog at the same time. Now I know that with this stroller, and the ability to lock the front wheel, I will be able to do this on my own. The stroller features an extra wide seat that includes mesh pockets that easily allows your child to bring his gear with him when you are on long runs or out at the park. The harness is a 5-point harness that I am getting used to using as a parent and is getting easier and easier to figure out with each new baby gear product. I love that this stroller is ensuring that my little guy won’t fall out. Another feature that I love on this stroller is the huge canopy. There is a peek-a-boo window that can be covered if needed and a huge sun visor that ensures that your child will be protected from the sun’s harmful rays. As stated before we did need to perform an alteration on the stroller. After jogging with the stroller the front wheel became wobbly. I emailed the company about the situation and immediately got a response. They showed us how to tighten the front wheel to get it ready for our runs. The factory settings on the stroller are for “average” runners or walkers so if you are going to be doing a lot of running with the stroller you will need to tighten the wheel as well. I am glad that we were able to do the adjustment ourselves, and the customer service was very efficient. 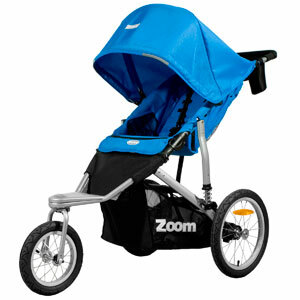 The Joovy Zoom 360 Jogging Stroller is a very smooth ride. It glides along the pavement with ease making jogging enjoyable. I have tried a couple of different jogging strollers and this one is the smoothest by far. Joovey makes quality products and you won’t be disappointed with the craftsmanship. Overall, we are enjoying our family walks. 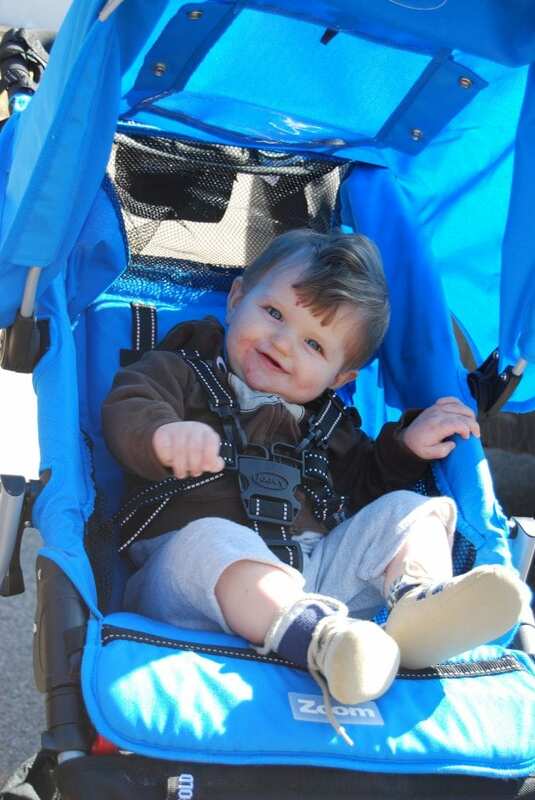 When the weather gets even warmer we will be enjoying this stroller more and more. This product is helping my new year’s resolution and allowing me to hang with my family at the same time. The Joovy Zoom is stylish and durable. If you are looking for the smoothest stroller ride you have ever had, you need to check out the Joovy Zoom! I was not compensated for this review other than a product sample provided by Joovy. All opinions are 100% mine. That little guy looks super happy and comfortable. Love it! SO want one. I wonder if they make double strollers, since I have twins on the way…. Boy, strollers have come a long way since my kids were little! My strollers look like ancient relics compared to this one. It says a lot that this stroller can be pushed easily “off road.” The one I have now doesn’t even push easily in the mall. LOL!! It can be extremely tiring. I love those strollers! Totally wish we could afford one. Great stroller! Easy to push and your son looks happy. Perfect! Very cute family! Your dog is beautiful too. The snazzy Zoom stroller will be an incentive to take more walks this summer….